Satellite Emitters monitored in the 136 to 400 MHz Band at the Netherlands. Launched on 13 Dec 1964 as the second operational TRANSIT spacecraft, it should be more correctly called OSCAR -2, O-2 or NSS 30020. Unfortunately, the navigation system failed within 2 weeks of launch. The telemetry beacon can be CW or modulated depending on solar lighting conditions. The PAM data is 35 steps with a repeat cycle of about 12.5 seconds. Each step has a duty cycle of about 75% data value and 25% return to centre frequency value. These steps vary a 5400 Hz centre frequency sub carrier oscillator, IRIG 10, that then frequency modulates the RF carrier. Another SCO at 10.5 kHz, IRIG 12, is sometimes present. It has a pattern of five pulses with gaps, followed by a longer gap at about a 1.5 Hz rate. A SSB receiver will resolve, separately, the carrier as a single tone and each of the sidebands as "musical" tones.Radiation satellite. Studied magnetic field, celestial field, ultraviolet data. This satellite is still transmitting and thus is probably the oldest satellite still transmitting. The sequence of tones has speeded up quite considerably over time.. The seventh in a series of satellites, SOLRAD, carries the device for the detection and measurement of solar radiation (X-rays) within the project Grab (Galactic Radiation and Background). Some of the satellites SOLRAD have also carried a pilot equipment to detect signals from the Soviet radar. Meteorological satellite, the main equipment were two wide-angle TV camera. Served until the end of July 1966, when it was finally deactivated. Approx 1280 Hz. Intermittent operation. Alouette-2 on 136.59 MHz re-discovered by Raydel Abreu Espinet of Cuba in early August 2013. Called SECOR 7 by Space-Track. Conflicting information on this satellite. Some sources (including codes in the tables Kepler elements) claim that this is basically surveying EGRS (SECOR) -7, while others indicate ERS-15 (experimental satellite that was inter alia an attempt to cold seal). The telemetry is random levels of about 8 seconds duration each, on a 1300 Hz centre frequency SCO that amplitude modulates the RF carrier. The RF exhibits short term frequency instability. ISIS-1 (International Satellite for Ionospheric Studies), a Canadian satellite to study the ionosphere, launched in 1969. The equipment had different ionosphere sirens VLF receiver, particle sensors, ion mass spectrometer, electrostatic probe and analyzer, radio beacons and experimenting cosmic noise. The satellite was deactivated in 1990, radio beacons can still be heard. EGRS 13 (Electronic & Geodetic Ranging Satellite or Experimental Geodetic Research Satellite), a precursor and basis for later 'timation' and 'GPS' satellite. Also known as SECOR 13 (Sequential Collation of Range) is a joint project of the US Army and Aviation, and they used it for land surveying - precise points on the Earth's surface. They used a signal from the successive positions of the satellite system consisted of 3 base station ground stations accurate and fourth with unknown coordinates. Satellite ground stations have a signal coming from the signals were sent certain position of the satellite and ground station unknown. All ground stations were fully transferable. SECOR satellites are set up to enable the continents and islands in a geodetic network, and they represented the basis for further satellites' timing and later the GPS Navstar. EGRS with a SECOR (Sequential Collation of Range) transponder. The mission of the "poppy" satellites was to gather ELINT data on Soviet radar stations in the years 1962-1977, seven satellite series were launched. The program leads to the RSZ satellite surveillance system with more and improved sensors. Apparently "Poppy-6" is wrongly identified as "S69-4".POPPY program declassified 12 Sept 2005 by NRO. Preliminarily called POPPY-6B, also known as OPS 7613 P/L 4 or NRL PL162. Historically but incorrectly called S69-4. Satellite timation (Time / Navigation) is a navigation try to see that the passive determination of the distance to the satellites and the exact time number achieve a global three-dimensional navigation. In fact recmo that distant pastors GPS system.In 1969, dismissed timation-2 sums up the Kepler elements marked as OPS7613 P / L 1Called OPS 7613 P/L 1 by Space-Track. Telemetry is PAM/FM/AM. 4 SCOs (Ch 4 960 Hz,Ch 6 1700 Hz, Ch 7 2300 Hz and Ch 8 3000 Hz centre frequencies). PAM is 30 levels plus a min and max calibration/sync pulses over 4 secs. Ch 4 floating, Ch 6 & 7 are repeating patterns, Ch 8 is a 4 Hz clock. Japanese scientific observation satellite. Its objective was to measure solar and cosmic radiation. The tracking beacon transmitted continuously on 136.695 MHz at 90 mW and real time telemetry was transmitted on 400.695 MHz at 45 mW. Incidentally still transmitting mid 2007 but now a continuous tone. On/off unmodulated carrier in daylight only. NOAA-9 was a third-generation operational meteorological satellite. The satellite design provided an economical and stable sun-synchronous platform for advanced operational instruments to measure the earth's atmosphere, its surface and cloud cover, and the near-space environment. Primary sensors included (1) an advanced very high resolution radiometer (AVHRR), (2) a TIROS operational vertical sounder (TOVS), (3) an earth radiation budget experiment (ERBE), and (4) a solar backscattered ultraviolet radiometer (SBUV/2). The secondary experiment was a data collection and platform location system (DCPLS). A search and rescue satellite aided tracking (SARSAT) system was also carried on NOAA 9. The satellite was based upon the Block 5D spacecraft bus developed for the U.S. Air Force, and was capable of maintaining an earth-pointing accuracy of better than plus or minus 0.1 deg with a motion rate of less than 0.035 deg/s. Only 136.77 MHz in daylight only. ECS-4 (EUTELSAT 1F4) Prime manufacturer British Aerospace Platform ECS-Bus Operator ESA / Eutelsat Mass at launch 1158 kg Equipment 12 (+2) Ku-band transponders Solar array 2 deployable solar arrays. In inclined orbit since mid-May 1993. Transponders 1, 5, 7, 8, 9, 10, 11 and 12 have failed.Beacon: 11.44965 GHz. The Control Centre at the Redu (Belgium) ground station has performed a series of East re-orbiting manoeuvres which have put ECS-4 at an altitude of at least 414 km above the useful geostationary orbit. All the remaining on board usable fuel has been used for these operations. The first ECS-4 re-orbiting manoeuvres took place as scheduled on 26 November and the final command for graveyard configuration was uplinked at 17:22 UTC on 1st December 2002. Now drifting westward at approximately 5° per day. Telemetry is 160 bps NRZ TDM PCM data, Bi-Phase-L coded, BPSK on 2560 Hz subcarrier, PM on 137.1420 MHz at 8 Watts. Signal has deteriorated over the past year, now 5-10 minute carrier on with or without data subcarrier and 50-80 minutes carrier off. ECS-5 (EUTELSAT 1F5) Prime manufacturer British Aerospace Platform ECS-Bus Operator ESA / Eutelsat Mass at launch 1158 kg Equipment 12 (+2) Ku-band transponders Solar array 2 deployable solar arrays. Beacon: 11.44895 GHz. In inclined orbit since 1 Aug 1994. Transponders 3, 4, 6 and 8 have failed. First Eutelsat satellite to provide transatlantic connectivity.re-orbited above geostationary orbit May or Aug 2000, now drifting westward at approximately 5° per day. HAMSAT is ISRO’s first theme based Micro-satellite meant for providing Satellite based Amateur Radio Services to the National as well as International Community of Amateur Radio Operators (HAMs). Launched in May 2005 on-board the PSLV-C6 Mission as an Auxiliary Satellite, it will meet the long felt need for the Amateur Radio Operators of South Asian region who possess the required paraphernalia and operate in the UHF/VHF band based Satellite Radio Communication Channel. 256 bps on ± 25.6 kHz subcarrier sidebands & ±51.2 kHz unmodulated sidebands. NO-44 was launched 30 September, 2001 at 0240Z aboard the “Kodiak Star”, a Lockheed-Martin Athena I launch vehicle. This was the first launch from the Kodiak Island Launch Complex. NO-44 was one of four payloads on this launch, which was a collaborative effort between NASA and the DoD. NO-44 was built by Navy midshipmen. Battery issues caused problem on the satellite resulting periods where it would be reset three times a year. Ultimately, NO-44’s mission was declared at an end on 26 April 2003, and dead on 17 July, although this seemed a bit premature. The satellite was alive and well in September of the same year and was functional for the period of 13 September 2003 – 9 October 2003. Since this time, there have been numerous attempts to totally recover the satellite, but further attempts have been stopped. NO-44 remains on and active when conditions are favorable for sunlight, usually in mid-day passes, although by the time it covers about 30-45 minutes into eclipse, power drops. In just six months time engineers at the University of Surrey developed, built and launched on 01-03-1984 UoSAT-2 as a piggyback payload aboard a U.S. Thor-Delta rocket carrying the LANDSAT-D earth observation satellite from Vandenberg Air Force base in the orbit. With 70 kg was UoSAT-2, the first satellite with advanced digital “store-and-forward (email)” communication with back-programmable microprocessor and contactless memories. To include different payload experiments: a speech synthesizer (Alker digit), with the messages or telemetry values can be output, a CCD camera and radiative and particle sensors. AO-7 (aka AMSAT-OSCAR 7) is the second Phase 2 amateur satellite launched into Low Earth Orbit on 15 November 1974. It remained operational until a battery failure in 1981. On 21 June 2002 the satellite was heard again on its 2 meter beacon (145.9775 MHz CW) after 21 years of silence, and 27 years in space. On July 11, 2002, AO-7 was successfully commanded for the first time since it was declared dead 21 years ago. Commands were sent and accepted to change the CW beacon code speed. So far, 11 different commands have been accepted by AO-7. AMSAT reported AO-7 still semi-operational on 6 April 2006, with reliable power only from its solar panels; the report stated the cause of the outage was a short circuit in a battery and the restoration of service was due to its becoming an open circuit. The satellite eclipses on every orbit during the northern summer and autumn; the rest of the year it is in continuous sunlight and alternates between transmission modes A and B. Two types of communications repeaters are aboard the spacecraft, only one of which operates at a time. The first repeater is a higher power, two-watt version of the one-watt two-to-ten motor linear repeater that flow on the OSCAR 6 mission. This unit receives uplink signals between 145.85 and 145.95 MHz, and retransmits them between 29.4 mid 29.5 MHz an the downlink. A 200 milliwatt telemetry beacon provides telemetry data on 29.502 MHz. * Approximately -100 dBm is required at the repeater input terminals for an output of 1 watt. This corresponds to an eirp from the ground of 90 watts for a distance to the satellite of 2,000 miles and a polarization mismatch of 3 dB. The second repeater, constructed by AMSAT Deutschland e.V., AMSAT’s affiliate in Marbach, West Germany, is a 40-kHz* bandwidth linear repeater. It employs an 8-watt PEP power amplifier using the envelope elimination and restoration technique to maintain linear operation over a wide dynamic range with high efficiency. This repeater has an uplink from 432.125 to 432.175 MHz, and a downlink from 145.925 to 145.975 MHz. Since the uplink band in shared with the radiolocation service, an experimental pulse suppression circuit is incorporated in the repeater to reduce the effects of wideband pulsed radar interference in the uplink. Developmental versions of this repeater have flown in high-altitude balloon experiments in Germany, and aircraft flight tests of the repeater prototype unit. A 200 milliwatt telemetry beacon on 145.975' provides telemetry data. Approximately So W.*eirp is required to produce 3 watts of repeater output at a range of 2,000 miles assuming.& polarization mismatch of 3 db. GEOSAT (geodesic satellite) satellite is the US Navy, the main equipment is the radar altimeter, which is precisely its mapirali natural geoid over the oceans, among other things, it used to accurately measure the height of the waves. In addition, the Navy was made possible by the use of certain data from the satellite agencies such as NOAA and NASA. Beacons 150 and 400 MHz are also used for research and dimensions in the ionosphere. Fengyun-1D (FY-1D) is a polar orbiting weather satellite. The 430-kilogram satellite has a 10-channel scanning radiometer. Fengyun-1D was co-launched with Haiyang-1 on 5/15/02. Fengyun-1D will be a replacement for Fengyun-1C. CBERS 2B (China-Brazil Earth Resources Satellite 2B), also known as Zi Yuan 2B, is a China-Brazil joint craft that was launched by a Long March 4B rocket from Taiyuan Satellite Launch Center in Shanxi province at 03:26 UT on 19 September 2007. The 1.5 tonne, 1.8 m x 2.0 m x 2.2 m, triaxially-stabilized craft carries a low 20 m resolution, and a higher 2.5 m resolution camera. The data will help in crop estimation, urban planning, water resource management, and military intelligence. LES- 1 (Lincoln Experimental Satellite 1) is a US military communications satellite launched from Cape Canaveral aboard a Titan 3A rocket. LES-1 failed to reach Geostationary position when the booster rockets failed leaving it in HEO. It was abandoned in 1967. Besides the UHF telemetry transmitter it featured also an X-band transmitter with 100mW output. More specifically this was a beacon transmitting at 7740 MHz and a communications transponder with an uplink at 8350 MHz and a downlink at 7750 MHz. Transmissions of LES-1 were discovered 47 years after its launch by Phil Williams in Cornwall/UK on Dec 18th 2012 and verified by other members of the #hearsat group. The transmissions are not every day and seem to be linked to extended periods of times when the satellite is in sunlight. It seems that the transmissions are interrupted by the availability of extended times when the satellite is in sunlight. The satellite is evidently tumbling as can be heard by the wobbling carrier with a time constant of about 4.5 seconds. The signal is a single un-modulated carrier on 236.997Mhz. OV3-3 1966 August 4 10:45 GMT Launch Site: Vandenberg. Mass: 75 kg (165 lb). Type: Magnetosphere satellite. Summary: Radiation measurements. Space craft engaged in investigation of spaceflight techniques and technology (US Cat A). AKEBONO / EXOS-D, launched on Feb. 22, 1989, continued its observation activities for 26 years and two months, amazingly longer than its target life of one year, and attained various important achievements including aurora phenomena in the polar region of the Earth and the long-term periodical changes of the Van Allen radiation belt. The purpose of the Exos D or Akebono mission was to investigate the particle acceleration regions above the auroral region in order to develop a better understanding of the acceleration mechanism and of its relation to substorm phenomena. The spacecraft was spin-stabilized with a rotation rate of 7.5 rpm. The attitude was magnetically controlled with spacecraft axis pointing to the sun. All onboard operations such as command and data acquisition were controlled by an onboard computer permitting automatic operations for a full week.JAXA stopped sending and receiving radio waves to and from the Aurora Observation Satellite “AKEBONO” (EXOS-D) at 3:59 p.m. on April 23, 2015 to terminate its operation, due to the degradation of solar cells and the decay of orbit. Meteor M-N1,21 March 2016 LRPT off Rate ½, k = 7 Convolution coded, I = G1, Q = G2, Power I:Q = 1:1, Symbol Rate 72 or 80 kilosymbols per second CCSDS Format. SCID 00, VCID 05 with 3 out of APIDs 64 to 69, (MSU-MR channels 1 to 6) or VCID 63, Fill Can use either 72 kbps mode or 80 kbps Metop LRPT mode with Unique Word (UW) Insertion. The inclusion of the MSU-MR and the radio range of the meter range in the abnormal functioning of the orientation system on the Meteor-M spacecraft No. 1 has no practical meaning. With such speed of rotation on different axes, adequate reception conditions will not be provided, and the picture is unlikely to satisfy anyone, even the most unpretentious person. Do not expect too much from the spacecraft, flying beyond the warranty period. In addition, the inclusion of additional energy consumers, can lead to a shortage of energy. In short, when one specific fault occurs in the channel channel of the body orientation system, it becomes possible for non-standard means to establish an approximate orientation. But the manifestation of the above-mentioned malfunction in the past emerged spontaneously and there is no possibility to simulate the situation. Due to the lack of a normal orientation, the target and bis-mv were disabled. But even now, the data of its equipment are in demand and are used to support the work of ISS crew members in orbit. Carrier cf on 1700 with sidebands +- 700KHz sending unmodulated data. During weathersat reception of NOAA/Meteor on the 137 MHz band i did see quite often unidentified interrupting signals. After a bit of Googling around I learned that these were Dead Satellite’s that still are broadcasting given the right sunlight conditions, the signal strength is sufficient to show up in SDRSharp, not all signals are very strong some very weak and needed a good close up zoom in SDRSharp. There are many shutdown Satellite’s who apparently having a life of their own varying from Military, Navigation, Experimental, Weather, and also Amateur ones. Most are not transmitting any usable telemetry or weather images but they still use the original frequencies to sent out a unmodulated carrier, which interferes with the current operational Satellite’s in the 136/138 MHz band. Normally when a satellite goes out of service and runs almost out of fuel the last reserve is used to shift it in a graveyard orbit which resides above the normal operation orbit, it will be switched off and left on their own. But this will not always goes as planned, sometimes due solar radiation or other technical failures it will not respond again to the ground station commands, which leaves the Satellite in its current orbit. Some have a timer onboard which will be activated at end of life scheduled to end/shortcut the power feed to the transmitter so it will not broadcast again, also this can fail. Until some day they might not work at all anymore.. Thanks fly out to: DD1US does have a very nice collection images and orginal sounds, Mike Kenny’s his list of frequencies 136-137 are a copy from his website and the more in depth excellent details, and offcourse thanks Greg Roberts! TLE containing all current Dead Satellites Weekly updated. Name, Catalog number can have different names and numbers in orginal TLEs. Gallery with SDR Screenshot's Happysat. 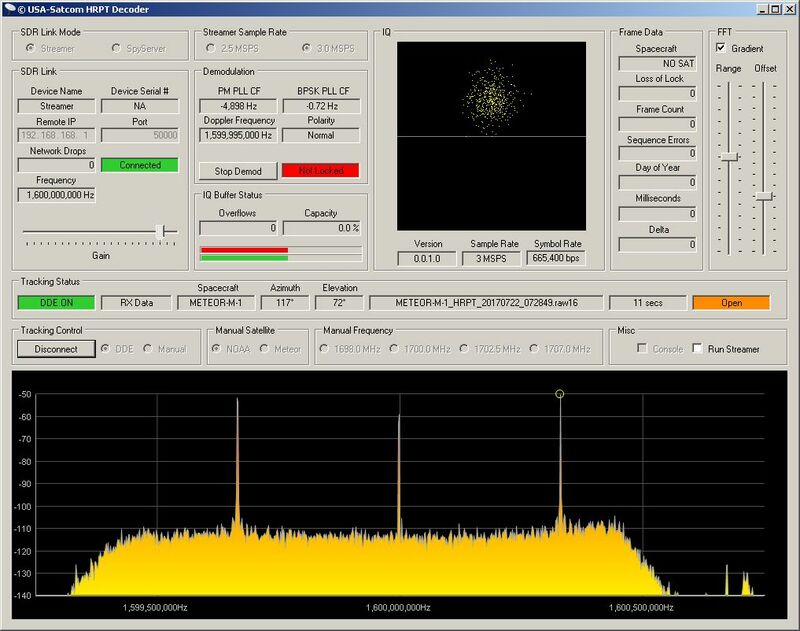 "Receiving Dead Satellites with the rtl-sdr" Happysat. "Signale von untoten Wettersatelliten" Maik Hermenau. "The Satellite that came back to life LES-1" Hackaday. "Orbits of the Lost" Atomicthumbs. "Vintage Micro: The First ELINT Satellites"
"Where old satellites go to die" Eumetsat. "ATTACK of the ZOMBIE SATELLITE" The Register. "Satellite Emitters monitored in the 136 to 138 MHz Band at Melbourne, Australia." MDKenny. "Radio Transmissions from OuterSpace"Greg Roberts, ZS1B1, AMSAT-US Journal, March, 1980. "Satellite Transmitting Status"Gregory Roberts, Journal of Environmental Satellite Amateur Users Group (JESAUG), pp.10-13, Vol 4 No 3, 86-3, 1986. "Satellite Radio Transmissions: 136-138 MHz"", Chapter 14, Table 14-10, The Satellite Experimenter's Handbook, 2nd Edition, ARRL, 1990.